Interests - Reading, arts and crafts, anything girly. Lucy was born with very complex congenital heart disease which was diagnosed when she was about 18 hours old. She underwent two open heart surgeries, the first when she was 2 days old and the second when she was about 6 months old. She suffered total heart block as a result of this surgery and had to have a permanent pacemaker implanted a week after the surgery. This was replaced in January 2005. She had to have major stomach surgery in November 2002 as she suffered from malrotation of the stomach and intestines due to one of her heart conditions. She doesn’t have a spleen either due to this particular heart condition. Lucy was always supposed to have had a third open heart surgery around the time of her 5th birthday. Alas, this was not to be because her heart would have never been able to cope. She was hence in heart failure. In September 2005 it was suggested that Lucy be referred to Great Ormond Street Hospital to their heart failure team where her care would be taken over. We were actually referred to the Transplant Team there and went for assessment in December 2005. The Team deemed her suitable for transplantation and she was placed on the Active Transplant List on 16th December awaiting a heart. Lucy waited a long time for her heart, but during the Summer of 2006 was very lucky to receive the all important call that a suitable heart had become available. She recovered from the surgery very quickly and made a good recovery. Unfortunately Lucy is back in hospital and will be for at least another 2 weeks, having been there for the last 12 days. 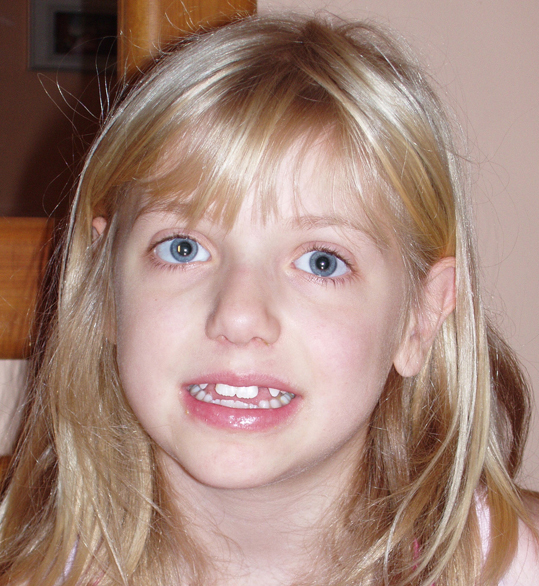 Her donor was positive for a virus called cytomegalovirus or CMV as it is more commonly known. She is very poorly at the moment and at the moment we are living day by day awaiting the next set of blood results. The virus levels haven’t been coming down in her blood so she has had to be changed onto a stronger drug which is more toxic. They are having to watch her kidney function as well as checking things like her eyes for damage. I think it’s only fair that Lucy moves on from Post Pals. If things change in the future with regard to the high white cells and lymphocytes then I will let you know. There are so many poorly children out there who need the smiles that post can bring to them. Thank you so much to all of the team and everyone who has written and taken the time to send things to the children. You really have made a difference. Lucy’s white cells and lymphocytes are still high. She’s having more physio than she usually has and is going to start hydrotherapy too. Thank you this month for the birthday card for Alice and the letter for Lucy. Lucy, Alice and Ben would like to thank everyone for all of the lovely letters, cards and gifts that they received over Christmas. They are very, very lucky children. Lucy had her annual review back in September. Everything was good, so the Hickman line came out and she had a reduction in her MMF which is one of her immuno suppressants (they halved the dose). CMV hasn’t been detected since May 22nd of this year – day easily remembered because it is Lucy’s big brother’s birthday. She’s been suffering from a bad cold/cough since the second week in September, surprise surprise, not long after she went back to school. So during the regular blood tests she’s been having, an elevated white cell count had been noted and of course was monitored. It went up to 32 at one stage, coupled with that she’s had quite a high EBV (Epstein Barr Virus) level, which again has been monitored. We had a phone call from her Transplant Unit asking us to take her up for investigations. They wanted to do a scan and chest xray to look for swollen or enlarged lymph nodes deep within her body. Thankfully none were found. The consultant did mention that he wanted blood films made and if anything untoward was found, he said that a bone marrow biopsy may be necessary. We’ve been beside ourselves with worry as we knew her lymphocytes were high – but then that’s a parent’s job isn’t it? Anyway, the general consensus of opinion was that it may be her MMF that was causing the irregularities in her blood. She was to have her MMF dose halved again. Blood tests will be done at the beginning of December to check the status of the white cells and lymphocytes. Fingers firmly crossed that it is this that is causing the problem and NOT anything more sinister. Don’t tell her I’ve told you this because she doesn’t yet know, but she’s not allowed to be ill because we are going to Lapland for 4 days in December… all 7 of us!!! Can’t wait, and certainly can’t wait to see the little ones’ faces when they meet the big man himself. This trip was given to her after her appearance on the Sharon Osbourne Show last year where she was promoting organ donation. Unfortunately she was too ill to take it last December, but the kind travel firm agreed to carry the trip over to this year. We had a mad dash to A & E with her on Sunday evening. She had been making pretend dollar bills after watching Spongebob with her little sister! Unbeknown to her she had cut the top off her left thumb… with a pair of BLUNT PRESCHOOL SCISSORS of all things. Her daddy is a first aider, so knew exactly what to do, whilst I nearly passed out on the floor! I can do everything else – can watch her be intubated/extubated, watch whilst they try to put a line in etc, but be damned if I can deal with that amount of blood and a nasty looking thumb. The scary thing is that she didn’t even know she’d done it and that it didn’t hurt her at all! After sitting in A & E for half an hour (which is good for them), we’d managed to stem the bleeding with pressure. One of the senior nurses dressed it and told us that we could go, but to get the dressing changed on Thursday of this week. Thank you to everyone who has continued to send the children cards, because I have been totally rubbish at keeping you updated on how things are going. Lucy is continuing her once daily IV’s and will be for at least another 6 weeks. The CMV is being rather problematic and at the moment everything is very much a case of waiting to see what happens. She is going to Great Ormond Street for a heart biopsy and coronary angioplasty on 18th May. If there is no rejection then her anti-rejection meds may be reduced. If all goes ok with that then they may stop her Foscarnet IV treatment. Hopefully her body will keep the CMV in check, but we have previously found it hasn’t, so no one can be absolutely certain that this will be the case. Thank you for her lovely parcels that she has been receiving and thank you to whoever sent her the Easter Egg – she won’t eat it! Lucy has developed the CMV again. This is her 3rd infection since her transplant last year and it was decided to put a more permanent line in as she is struggling with the amount of needles and cannulas that are needed. She now how a tunnelled line in situ which will probably stay in for a couple of years. She has named it “Mrs Wiggly”. Lucy is part way through another 3 week course of Foscarnet which is bringing the virus levels down nicely. We just hope that we get a reprieve for a while after this latest bout of the virus as we are all totally worn out. As soon as the virus levels are down she needs to go into Great Ormond Street for a heart biopsy (to check for rejection) and a coronary angio (to check whether the CMV is causing narrowing of the coronary arteries). Fingers firmly crossed that these tests reveal nothing sinister. Thank you to everyone for their kind wishes via email and for her letters, cards and gifts – they are very much appreciated. Just to let you know that Lucy will be in hospital for one more week, so that takes us up to next Friday. Her CMV levels are lower than they were last week, so that is a good sign. Lucy has to go back into hospital for more IV’s to clear the CMV as it has gone high again. We are looking at 3 weeks. Thank you to everyone for the Christmas cards, especially the reindeer cards! Lucy’s virus levels have dropped dramatically – now down to 16,700 which is absolutely brilliant news. Her biopsy date has been changed to 26th January which means that she will be able to enjoy her sister’s birthday party now. She is very much looking forward to Christmas – as are we – and is looking incredibly well. Infact she looks the best we have seen her for a couple of months. We are enjoying every minute of the run up to Christmas. Thank you to everyone who has been sending Christmas Cards, she has really enjoyed receiving them. Lucy’s CMV levels are still causing concern. She went to GOSH on Wednesday. The consultant there can’t understand how she can be so well with the levels so high. She has to go in for a heart biopsy and coronary angioplasty on 5th January. The CMV can cause early onset of coronary artery disease so thus doing this test whilst she has the biopsy. It would have been checked at her yearly review otherwise. She has to have regular blood tests done to check the levels and is due back to Southampton on Monday for another. They have put her onto an oral drug, valganciclovir. If this doesn’t work then we are looking at having to go back in for IV’s, which will mean her being in over Christmas. Hoping and keeping fingers crossed that the oral drug works. Anyway, hope that you are all well and thank you so much for everything that Lucy has received. We went back into Southampton General yesterday for a repeat blood test. They are keeping an open mind because it may just have been the results from a rogue sample. The Registrar concerned has instructed us to be back at the hospital today, with a view to admitting Lucy yet again. It’s a blow because she will spend her 7th Birthday in hospital and I had so hoped she would be at home. Thank you to Kate for the lovely homemade cards and thank you to Becky for the lovely book of poems. Thank you also for the friendship bracelets received. After giving her consultant some initial concerns, Lucy had made a good recovery from the CMV and is home now after 4 weeks in hospital. Thankfully the CMV would not have caused her to reject her heart, but the doctors concerned were keeping a close eye because she presented with D & V, so there were worries in the beginning that she wasn’t absorbing her anti rejection medications properly. There is still sign of the virus in her blood, so she is returning to hospital twice a week on a Monday and Thursday to have blood tests to check the levels. Hopefully, with time, the virus level will drop to zero. She is on a drug called valaciclovir and has been since she was transplanted. The dosage has been increased slightly to help bring the level back down. Lucy would like to say a big thank you to everyone for their lovely cards and best wishes that have been received since she has been in hospital. I would personally like to thank everyone too, especially the people who have thought of Alice and Ben and sent them cards – they both found it really hard having Lucy in hospital this time. Receiving some post themselves really put smiles on their faces! Also thanks to the people who have emailed and have left messages on her guestbook, we will get round to emailing you all individually I promise. Lucy is due to go back to school soon for the first time since July of this year. It will be just mornings to start with and we shall see how she goes. There is then her birthday to look forward to – one that we didn’t think we would be celebrating this year, but thanks to her Donor and their family we will be and it will be extra special.